W.e.f. 1.1.2006, pension is calculated @ 50% of emoluments (last pay) or average emoluments (for last 10 months), whichever is more beneficial to the retiring Govt. servant (Rule 49). (ii) In the case of civil proceedings, on the date the plaint is presented in the court. In terms of para 4.1 of OM No.38/37/08-P&PW(A) dated 1.9.2008, the pension/family pension will be consolidated w.e.f. 1.1.2006 by adding together (i) The existing pension/family pension, (ii) Dearness Pension, where applicable, (iii)Dearness Relief 24% of basic Pension/Basic Family Pension plus dearness pension as admissible vide OM No.42/2/2006-P&PW(G) dated 5.4.2006 and (iv) Fitment weightage @40% of the existing pension/family pension. Where the existing pension at (i) includes the effect of merger of 50% of DR w.e.f. 142004, the existing pension for the purpose of fitment weightage will be re-calculated after excluding the merged DR of 50% from the pension. The amount so arrived at will be regarded as consolidated pension/family pension w.e.f. 112006. The fixation of pension will be subject to the provision that the revised pension, in no case shall be lower than 50% of the minimum of the pay in the pay band plus the grade pay corresponding to the pre-revised pay scale from which the Govt. servant retired. The minimum of pay is the pay band/pay scale is to be reckoned in accordance with DoPPW OM No. 38/37/08-P&PW dated 30.07.2015. (1.14) Whether all pre-2006 pensioners/family pensioners would get benefit under Department of Pension and Pensioners' Welfare O.M. No.38/37/08- P&PW (A) dated 28.1.2013 (now OM dated 30.07.2015)? There will be no change in the pension of those pre-2006 pensioners whose pension (as revised with effect from 1.1.2006) is already equal to or more than this minimum limit mentioned in the OM dated 28.01.2013 and 30.07.2015. In the case of family pensioner also the minimum family pension as mentioned in CoI.10 of the Annexure to the OM dated 28.1.2013 shall be payable if the amount of family pension (w.e.f. 01.01.2006) is equal to or more than this minimum family pension, the same family pension shall continue to be paid. Orders were issued vide OM No. 38/37/2016-P&PW(A) dated 04.08.2016 for revision of pension of pre-2016 pensioners by multiplying the pre-revised pension by a factor of 2.57. This was to be done by the Pension Disbursing Authorities/ Banks. Further orders were issued vide OM No. 38/37/2016-P&PW(A) dated 12.05.2017. As per this OM, the revised pension/family pension w.e.f 01.01.2016 of all Central Civil Pensioners/ family pensioners, including CAPF’s, who retired/died prior to 01.01.2016, shall be revised by notionally fixing their pay in the pay matrix recommended by the 7 th CPC in the level corresponding to the pay in the pay scale/ pay band and grade pay at which they retired/ died. This will be done by notional pay fixation under each intervening Pay Commission based on the Formula for revision of pay. While fixing pay on notional basis, the pay fixation formulate approved by the Government and other relevant instructions on the subject in force at the relevant time shall be strictly followed. 50% of the notional pay as on 01.01 .2016 shall be the revised pension and 30% of this notional pay shall be the revised family pension w.e.f. 01.01.2016 as per the first Formulation. In this case of family pensioners who were entitled to family pension at enhanced rate, the revised family pension shall be 50% of the notional pay as on 01.01.2016 and shall be payable till the period up to which family pension at enhanced rate is admissible as per rules. The amount of revised pension/family pension so arrived at shall be rounded off to next higher rupee. The pension/ family pension already revised in accordance with this Department’s OM No. 38/37/2016-P&PW(A) (ii) dated 04.08.2016 or the revised pension/ family pension as worked out in accordance with OM dated 12.05.2017 shall be granted to pre-2016 central civil pensioners as revised pension/ family pension w.e.f. 01.01.2016. In cases where pension/ family pension being paid w.e.f. 01.01.2016 in accordance with this Department’s OM No. 38/37/2016-P&PW(A) (ii) dated 04.08.2016 happens to be more than pension/ family pension as worked out in accordance with para 4 above, the pension/ family pension already paid shall be treated as revised pension/ family pension w.e.f. 01.01.2016. A Concordance Table for fixation of notional pay of pension/ family pension of employee who retired/ died in various grades of Vth/ VIth CPC period has been prepared and circulated on 06.07.2017. These Concordance Tables are available on the website of this Department, i.e. doppw.gov.in and pensionersportal.gov.in. (1.17) Is there any online calculator available for fixation/revision of pension? A calculator for calculation/ revision of pension/ gratuity is available on the website of this Department, i.e. doppw.gov.in and pensionersportal.gov.in. 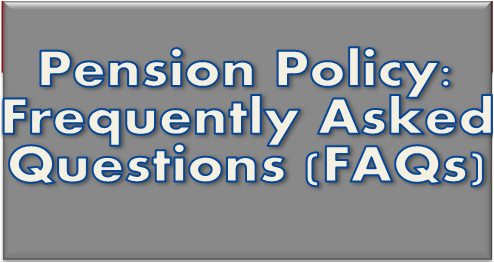 1.18) What is the amount of minimum and maximum pension after Seventh CPC? (1.19) From where can we download the pension /nomination Forms? Pension and gratuity of the employees retiring from Central Government Departments is regulated by the Central Civil Services (Pension) Rules, 1972.